One of the funnest parts of planning a Disney vacation is counting down to when you get to go. Don’t believe me? Just ask in any Disney facebook group for everyone’s countdown and you will get a huge response. There are a ton of great ways to do a countdown, and today I am sharing a super easy countdown idea with you that I am making even easier? How? 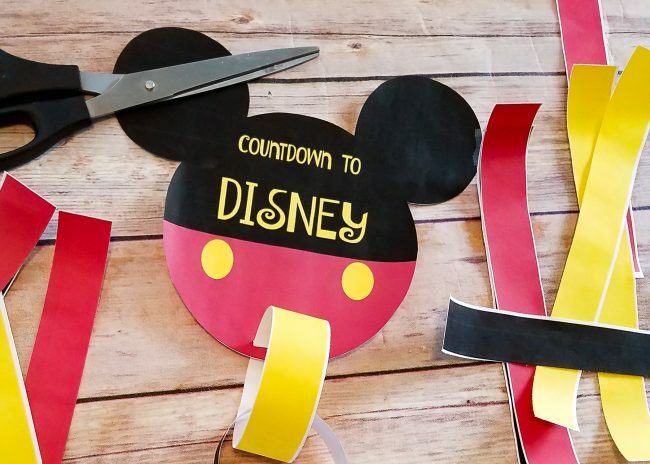 By giving making it into a free printable countdown to Disney! 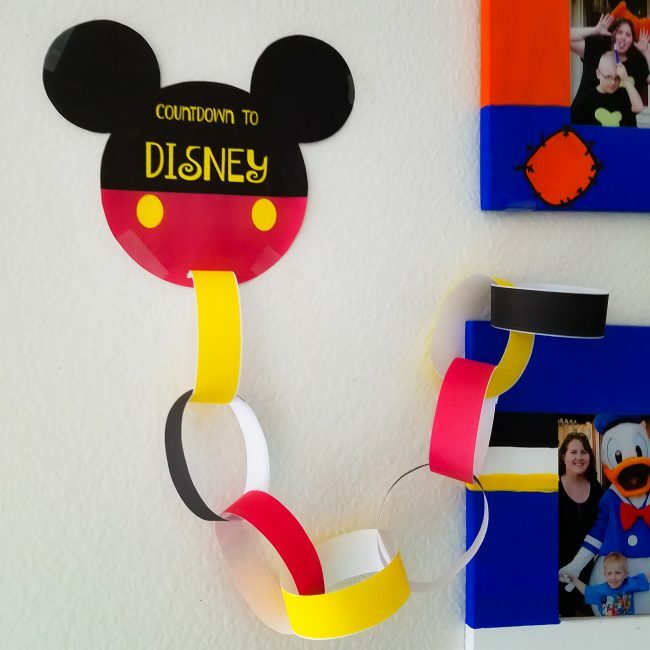 A paper chain countdown is probably one of the most basic ways to countdown to Disney, and kids love it. They get to rip a piece of paper every day after all. And they can also help make it too. 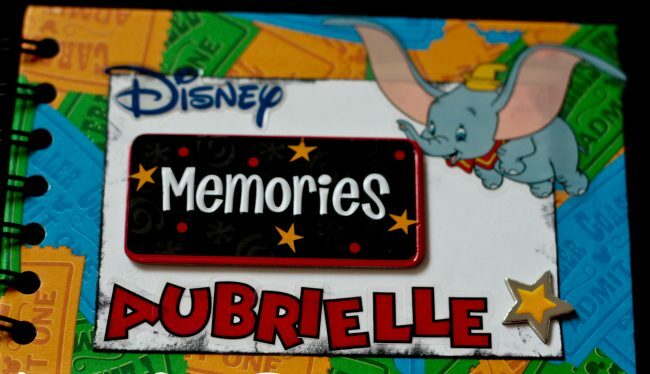 These are popular for Christmas, birthdays, days until summer break, and more. 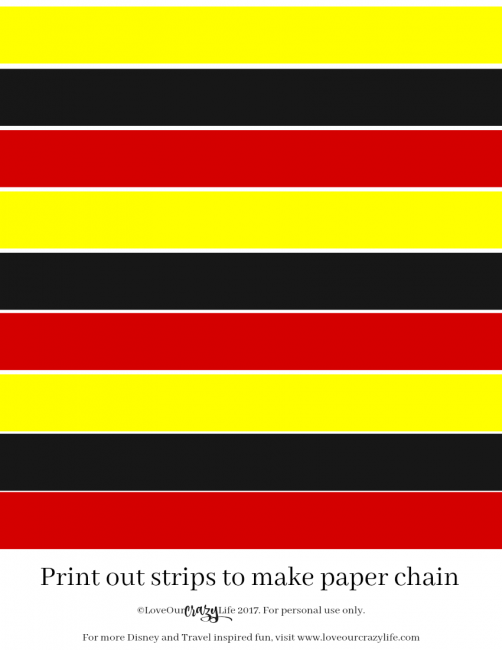 So today I am giving you a free printable countdown to Disney to make a paper chain countdown with. 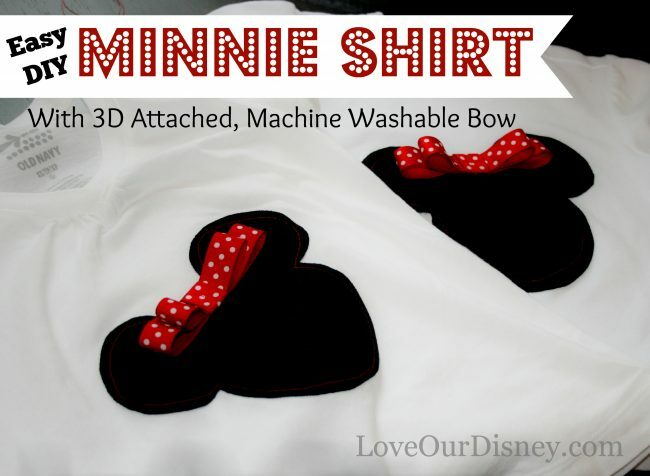 It includes this cute Mickey shape to attach your paper chain to. Not only that, but I am including a page with color strips in case you don’t have any yellow, black, and red construction paper. They are even measured to make sure they will fit through the slit on the Mickey Head sign. I am going to give you two separate printables, that way, you can easily print off as few or as many of the paper strip pages as you need for how many days you have until your trip. Each page has 9 strips. 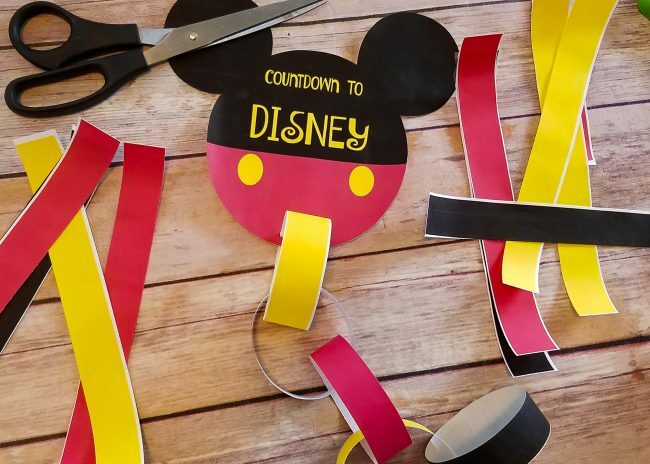 You will find your free printable countdown to Disney at the bottom of this post. Once you print it out it is pretty simple. I suggest printing the Mickey Mouse on card stock so it is a little stronger and then printing the colored strips on regular printer paper. After you print your pages, simply cut out the Mickey Mouse head. Then use scissors or an exacto knife to cut out the little slit at the bottom. Now just continue making links, running each new one through the previous one, until you have as many as you need for your vacation countdown. 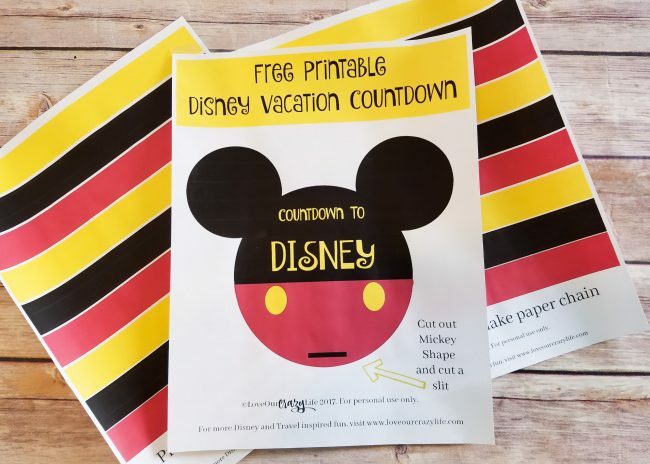 Now you can hang your free printable countdown to Disney up and starting counting down the days until you head on your magical vacation. For even more fun, you can write a different activity to do each day on the inside of each link. Then when you remove the link, do the activity for the day. It could be watching a Disney movie, singing a song, coloring a picture, anything. Printables are for PERSONAL USE ONLY! If you want to share this printable, please do so by sharing this post and directing others here to get the printable. 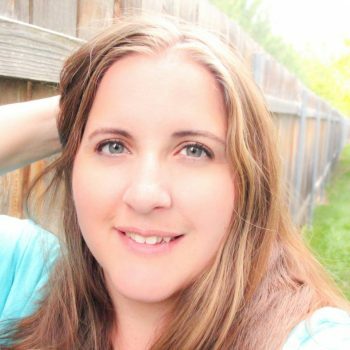 DO NOT remove the copyright from our printables and/or upload them to another site. To access the printable, you will need a PDF reader. Click the link (or image) and when the PDF opens, be sure to click download, and choose “open with” and choose your PDF reader. I suggest Adobe Acrobat. Once you open it in your PDF reader, THEN you may hit print and choose 100%. If you try to just print from the PDF popup, it may not print correctly. To get the Mickey Mouse countdown to Disney sign click the image above or CLICK HERE. 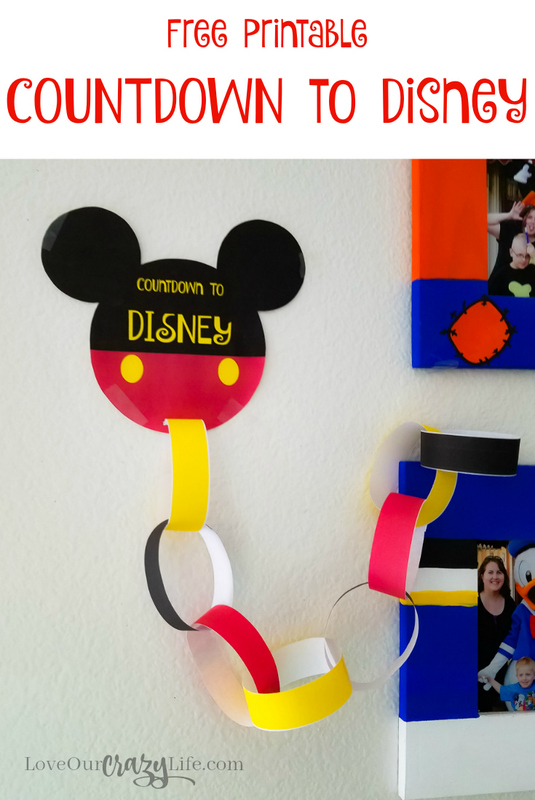 To access the free printable countdown to Disney strips to make the paper chain (if you prefer to print then use construction paper) CLICK HERE. 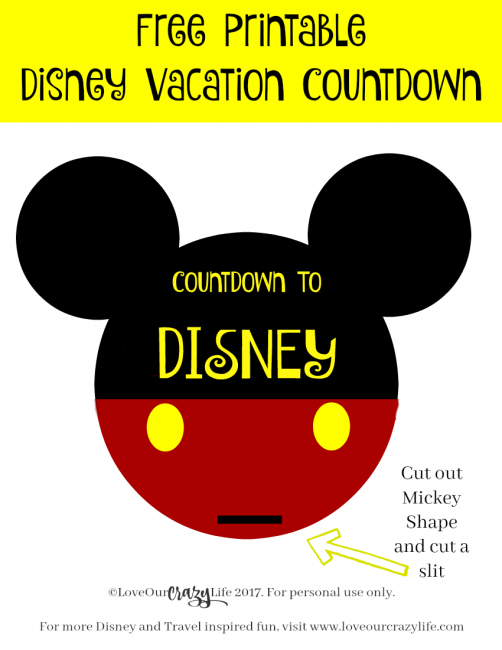 I hope you enjoy your free printable countdown to Disney. 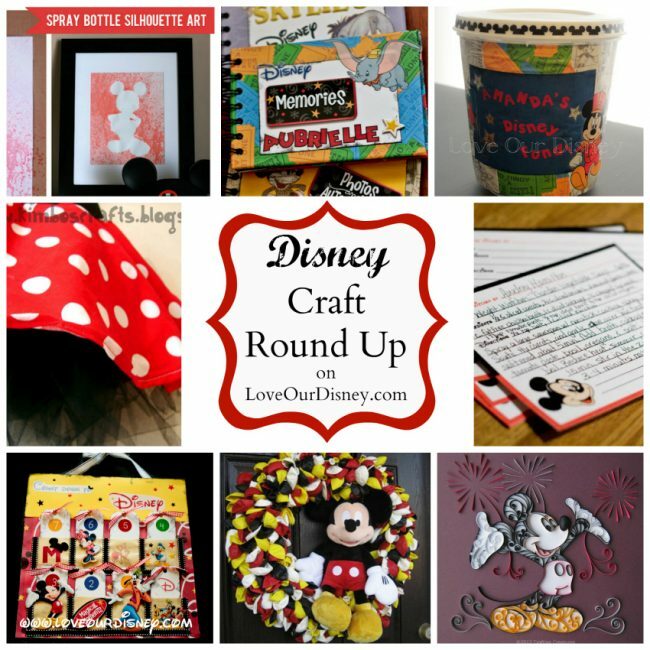 I also suggest checking out the following Disney crafts to countdown to your Disney vacation.